In this thirteenth archive story by Kristian Bertel, the photographer is seeking out the slum areas of Mumbai in India. Slums of India and the areas of slum and shanty towns in India has been of great interest for the photographer through the years. In central Mumbai just few kilometers away from the Andheri airport you can find the Dharavi slum. When visiting Mumbai it is hard not to ignore the slum areas of the city. In this archive story you can read more about the slums of India. Slum areas arise within the city, where people live in small shanty houses made of simple materials. Dharavi is one of the locations in Mumbai, India, that the photographer covered for a photo essay. It houses one of the largest slums in the world and the slum reflect life in the slums very well. A photo walk through the city's wide open slums tells you that despite a growing economy in India the urbanization still has its toll in India's many cities. The slum of Dharavi is a slum that was founded in 1882s during the British colonial era. The slum grew in part because of an expulsion of factories and residents from peninsular city center by colonial government, and from rural poor migrating into urban Mumbai, then called Bombay. When photographing in Dharavi it is easy to see that it currently is a multi-religious, multi-ethnic, diverse settlement. Dharavi's total population estimates vary between 300,000 to about 1 million people. Dharavi has an active informal economy in which numerous household enterprises employ many of the slum residents. It exports goods around the world. Leather, textiles and pottery products are among the goods made inside Dharavi by the slum residents. As a photographer going into the slum of Dharavi, it is understandable that Dharavi has suffered through many incidences of epidemics and other disasters. At India's independence from colonial rule in 1947, Dharavi had grown to be the largest slum in Mumbai and all of India. It still had a few empty spaces, which continued to serve as waste-dumping grounds for operators across the city. Mumbai, meanwhile, continued to grow as a city. Soon Dharavi was surrounded by the city, and became a key hub for informal economy. Mumbai has been one of the centers of India's urbanization for two hundred years. At the middle of the nineteenth century, after decades of urban growth under East India Company and British Raj, the city's population reached half a million. The urban area then covered mostly the southern extension of Mumbai peninsula, the population density was over ten times higher than London at that time. Most parts of Mumbai faced an acute shortage of housing and serious problems with the provision of water, sanitation and drainage. Residential areas were segregated in Mumbai between European and 'native' residential quarters. Slums were heavily concentrated in areas meant for 'native' Indian population, and it attracted no planning or London-like investment for quality of life of its inhabitants. Urban poverty encourages the formation and demand for slums. With rapid shift from rural to urban life which can be seen in Wadala, poverty migrates to urban areas. The urban poor arrives with hope, and very little of anything else. He or she typically has no access to shelter, basic urban services and social amenities. Slums are often the only option for the urban poor. 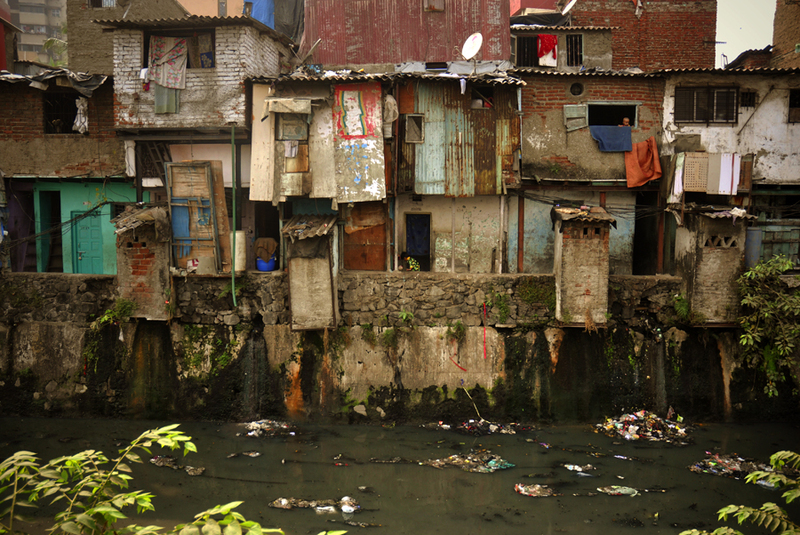 Slums typically begin at the outskirts of a city like in the Bandra and Wadala area of Mumbai. Over time, the city may expand past the original slums, enclosing the slums inside the urban perimeter. New slums sprout at the new boundaries of the expanding city, usually on publicly owned lands, thereby creating an urban sprawl mix of formal settlements, industry, retail zones and slums. This makes the original slums valuable property, densely populated with many conveniences attractive to the poor. At their start, slums are typically located in least desirable lands near the town or city, that are state owned or philanthropic trust owned or religious entity owned or have no clear land title. In cities located over a mountainous terrain, slums begin on difficult to reach slopes or start at the bottom of flood prone valleys, often hidden from plain view of city center but close to some natural water source. In cities located near lagoons, marshlands and rivers, they start at banks or on stilts above water or the dry river bed, in flat terrain, slums begin on lands unsuitable for agriculture, near city trash dumps, next to railway tracks and other shunned undesirable locations. With Mumbai the second largest urban agglomeration in the world is located in India, making it a major challenge in terms of urbanization. Fortunately, Earth's largest urban space provides plenty of inspiration as a prosperous megacity that runs like a well-oiled machine proving that even extreme urbanization can be overcome. But this wealth must not be confined to the highest social class. In the Indian capital of Mumbai, the economic capital of the South Asian republic, are the most expensive residential palaces in the country, but also the largest slum in Asia. Urban poverty, slums and limited access to safe drinking water and sanitation are just a few of the Herculean tasks that bring increasing urbanization and modernization rates for the country. Smart urban development strategies and clever government programs are needed to turn challenges into opportunities. Fortunately, some such initiatives have already been launched. Housing for All India has set itself a very ambitious goal that in year 2022, affordable housing should be provided for every poor household. The project envisages the construction of twenty million houses in urban areas in more than 2,500 cities. Funding and implementation should be through a combination of public and private initiatives, such as loan-linked grants and housing, which will be influenced by the beneficiaries. Shanty homes are often built hurriedly, on ad hoc basis, with materials unsuitable for housing. Often the construction quality is inadequate to withstand heavy rains, high winds or other local climate and location. Paper, plastic, earthen floors, mud-and-wattle walls, wood held together by ropes, straw or torn metal pieces as roofs are some of the materials of construction. In some cases, brick and cement is used, but without attention to proper design and structural engineering requirements. Various space, dwelling placement bylaws and local building codes may also be extensively violated. Overcrowding is another characteristic of slums. Many dwellings are single room units, with high occupancy rates. Each dwelling may be cohabited by multiple families. Five and more persons may share a one-room unit, where the room is used for cooking, sleeping and living. Overcrowding is also seen near sources of drinking water, cleaning, and sanitation where one toilet may serve dozens of families. "- The slums I have visited in India are like cities in themselves, where daily life evolves through the day, and as a photographer not only the people are interesting to photograph but also the wide variety of colors in plastic and the patterns of the roof tops are interesting subjects to photograph", the photographer says. India is a land full of stories. On every street, on every corner and in the many places in India, life is rushing by you as a photographer with millions of stories to be told. In the archive story above, you hopefully had a readable insight in the story that was behind the photo of a slum area in Mumbai. On this website of Kristian Bertel | Photography you can find numerous travel pictures from the photographer. Stories and moments that tell the travel stories of how the photographer captured the specific scene that you see in the picture. The photographer's images have a story behind them, images that all are taken from around India throughout his photo journeys. The archive stories delve into Kristian's personal archive to reveal never-before-seen, including portraits and landscapes beautifully produced snapshots from various travel assignments. The archive is so-far organized into photo stories, this one included, each brought to life by narrative text and full-color photos. Together, these fascinating stories tell a story about the life in India. India, the motherland to many people around the world, a land of unforgetable travel moments. The archive takes viewers on a spectacular visual journey through some of the most stunning photographs to be found in the photographer's archive collection. The photographer culled the images to reflect the many variations on the universal theme of beauty and everyday life in India. By adding these back stories the photographer's work might immensely enhanced the understanding of the photographs.